3 watercolours acc. nos. ? Stephen Sartin, in his 2001 catalogue, was only able to give the title, medium, size and acc no of this watercolour in the Town’s Art Collection. The artist and donor were a mystery for a long time. A previous Tagger had no luck finding either. It was only when Heather Davis, Conservation Manager at Lancashire Conservation Studios and Curator in charge of the Collection, took the disintegrating picture apart in April 2014 that two labels were revealed. 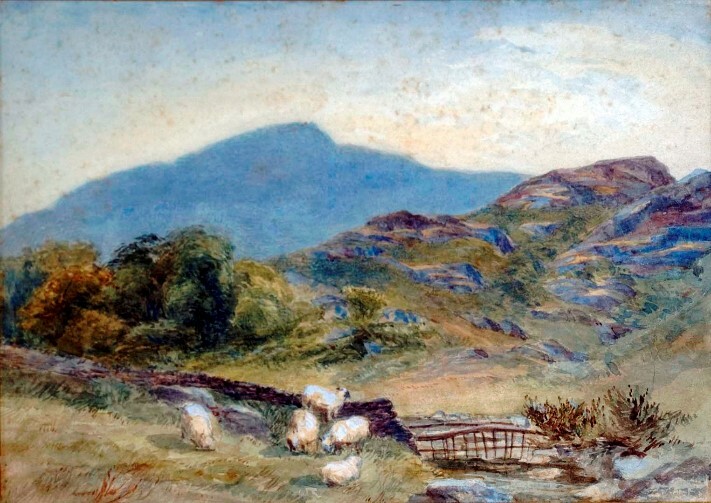 At the top we learned that the artist was “Miss Brierly of Lytham", the title “Coniston Old Man ” and the owner, W Chadwick Esq - but there was no date. At the bottom was the label of the famous art dealer, Richard Howarth of Blackburn, with its motto - “The pencil speaks the tongue of every land”. The name Chadwick was not a complete surprise as in Sartin’s catalogue it was reported that, “Four watercolours by Miss Brierley (with an “e “), presently unlocated, were donated by Mr W Chadwick, 34 Chatsworth Road, 28.10.46". It would seem reasonable to deduce that acc no155 is one of those. a Miss Helen Brierley at the same address. Were either of these the artist? Census returns for 1901 revealed the two were indeed sisters and then it was easy to track them back through the years. The 1861 census stated that Anne was an “artist painting” and we had our lady. Anne was one of six children born to Benjamin Brierley (1793-1861) and his wife, Sarah (1805-1869). The family hailed from Blackburn and the 1841 census showed them living in Richmond Terrace. Benjamin, who became a cotton manufacturer, married Sarah Boardman in 1826. Their children were Anne (1828-1908), John (1829-1908), Sarah (1831- ), Elizabeth (1834- ), Mary Jane (1837- ) and Helen (1842-1931). By 1861 Benjamin and Sarah and three of their children, Anne, Mary and Helen, were living with servants at 1 East Beach, Lytham. Benjamin died that year and Sarah in1869. “July 13, Died, Mr. Benjamin Brierley, cotton manufacturer, long an imbecile at Lytham”. By 1881 Helen and Anne, described as “annuitants”, were living at Levens, 12 West Beach, Lytham, but as previously stated, 1907 street records show their address was 12a West Beach, so it would appear that they divided the house. Anne died in 1908 and Helen in 1931 and her Will shows probate was granted to Margaret and Elizabeth Burdekin, who were related through Sarah Brierley, nee Boardman. Sarah’s sister, Margaret, married George Burdekin and Margaret and Elizabeth were their grandchildren. Margaret and Elizabeth Burdekin were to become generous donors to the Collection. Anne was a member of the Lytham Art Club, previously called The Valentine Art Club. Newspaper records show that Captain Augustus Wykeham Clifton opened the Spring Exhibition of the Valentine Art Club in 1884. In 1890 The Lytham Art Club exhibited at the Lytham Institute and proceeds were for the Manchester Sea-Side Home and other charities. Anne was one of the principal contributors. ​We have now discovered the catalogue of the Seventh Exhibition of The Lytham Art Club. The exhibition was held from 18 to 20 May 1893. The profits were to be given to the fund for the enlargement of the Lytham Institute. The catalogue listed 138 pictures, of which 29 were the work of Miss Brierley. Interestingly, one of the other exhibitors was the Reverend Thomas Gregory Smart MA (1827-1896), vicar of St John’s for 25 years. It is evident from the titles that Miss Brierley had travelled widely, visiting Westmorland, North Riding of Yorkshire, Herefordshire, Gloucestershire, Perthshire and Arran Island. It would seem she could afford to do so. Coniston Old Man is a popular subject with artists and photographers.